Classy little retreat with views toward the Navajo lift in winter, red rock in summer The Copper Cup has a small but efficient kitchen with Hawaiian coffee in the freezer. The pool and spa are just downstairs. A 42 inch TV is just above the pretty fireplace/heater so you can chill in comfort. Relax in this yummy queen Tempurapedic bed after a day`s of fun. Brian Head is known for great snow & short lift lines. Feel like getting out and meeting someone new, ejoy the Copper Chase lounge. Challange your loved one or a new friend to a friendly game of Foosball. The Copper Cup has a mellow charming & relaxing vibe. The glow of copper will reflect the happy glow on your cheeks after a day of fun on the mountain. The work out room is right next to the pool atrium. Want to stay buff Want to work off the big dinner you just enjoyed Laundry room in the building. You will feel right at home in this charming studio. You can usually pick your skiers up easily. The parking situation is a breeze compared to other resorts. The drive up the Parowan Valley to Brain Head is spectacular any time of the year. Be my guest, enjoy the snow but don`t wait long in line Your red rock view from the The Copper Cup in summer. A hopping terrain park for those who like to jump This is the meadow with the BBQ pit you over look in the summer. Whip up tasty food with pretty much everything you need in the small but efficient kitchen. Enjoy each other's company over a romantic meal and perhaps a glass of something at the dining table. Try coco or a toddy in the copper cups. Don't feel like cooking? Order a pizza & salad and pick it up less than 5 minutes away. A queen Tempurpedic bed eases aches and a Himalayan salt crystal lamp exudes those healthy negative ions to mellow your nights, inviting those relaxing zzz's. In the morning you can start your day with the Hawaiian coffee in the freezer (We are from Hawaii so we like to share some aloha with our guests.) During the day, your view is toward the Copper Chase meadow, the Navajo lift and red rocks beyond. In the winter, you can ski out this way and catch the shuttle back or navigate up 2 little hills to come back on skis. If you drive, you are less than 5 minutes to any of the lifts. In the summer, the Copper Chase meadow sports its large fire pit, tether ball & badminton/volley ball net. Though you have pretty much everything you need to make you comfortable in your own zone, you are just above the main lounge with its big fireplace, foosball table & TV if you are in the mood to spread out or socialize. The Copper Cup is a really a romantic retreat for two but if you have 1 or 2 children with you, there is a new queen hide-a-bed in the sofa and a great family time can be enjoyed by all. There are games in the cupboard. The kids will love the pool, and you will love the price. The nightly rate is for up to 2 people. Additional guests are $15/night per person up to 4 guests total. We just love being up In Brain Head in the winter & in the summer. It is beautiful and unpretentious. There are a number of restaurants close by. There are 2 little grocery stores on the mountain too. When you book with us, we send you tips to help you plan & enjoy your trip. Aside from great snow for skiers and boarders, great prices on lift tickets and small to nonexistent lift lines, the Brian Head Resort also has tubing parks in the winter. Snowmobile rentals and tours are also offered in the town. In the summer, the sightseeing, fishing, hiking, biking & ATVing are some of the best you can get. Stunning Cedar Breaks monument is within 10 minutes. The resort at Brian Head is now offering zip lines, water slides, archery and Frisbee golf in the summer. 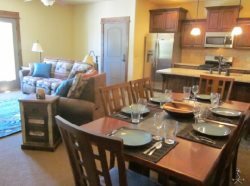 With a great little base like The Copper Cup with its amenities & location, book now & enjoy some Hawaiian hospitality in fabulous, homey Brian Head! * There is parking under the building but there is 7"2" clearance so if you have stuff on top of your car, you can park outside. We have always parked inside, but there are no assigned stalls. When it gets super busy, you may have to park outside; if you do, there is an assigned loading/unloading stall next to the elevator on the left.